"I know from the experience of a friend who is from Israel and from people who have worked there that there is a difference of opinion there among Israelis regarding their government's policies. It seems to me that dialogue is essential. . . . The people who call for a boycott of Israel own the narrow view that performing there must be about profit and endorsing the hawkish policy of the government. It's like never appearing in the U.S. because you didn't like Bush's policies or boycotting England because of Margaret Thatcher." Writing for the Israeli daily Ma'ariv and quoted in the Associated Press, one fan expressed exactly that: "There is an enormous group of people in Israel who are humanists and hunger for peace, who yearn for a normal life and are prepared to make painful concessions. And they are also sworn culture-lovers. . . . With this miserable decision of yours, it is this group of people you have weakened." Costello's verandering van mening is wellicht niet zo spontaan als het lijkt. De pro-Palestina lobby werkt op agressieve wijze achter de schermen voor dergelijke boycots. 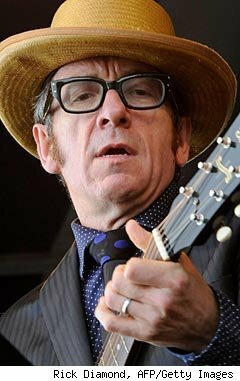 For a singer who croons about "peace, love and understanding," Elvis Costello has decided silence is more powerful than song. Wednesday, in a statement on his website, Costello announced he was boycotting Israel, pulling out of several already-ticketed shows scheduled for this summer in Caesarea, the Roman city on the sea, whose amphitheater hosts dozens of artists each summer. "[T]here are occasions when merely having your name added to a concert schedule may be interpreted as a political act that resonates more than anything that might be sung and it may be assumed that one has no mind for the suffering of the innocent," Costello wrote. "I must believe that the audience for the coming concerts would have contained many people who question the policies of their government on settlement and deplore conditions that visit intimidation, humiliation or much worse on Palestinian civilians in the name of national security." Unsurprisingly, the singer-songwriter has set off a chorus of: Excuse me, Mr. Costello, why now exactly? It is peculiar, to say the least, that Costello discovered the occupation, or his own discomfort, or the Palestinian cause, only well after his dates were booked, his seats filled -- almost as though it made more of a statement to create and then cancel his appearances. Writing to the singer in response to his withdrawal, Alive, the Israeli artist booking agency that had wooed him to Israel, noted: "Back in February, when you confirmed the performances in Israel, you were surely aware of the situation in the Middle East . . . and the long-standing conflict between the two nations. . . . Music should be a voice of peace and brotherhood, a unifying force and should not be turned off merely because the background noises seem too loud." Just two weeks ago, Costello told the Jerusalem Post: "I know from the experience of a friend who is from Israel and from people who have worked there that there is a difference of opinion there among Israelis regarding their government's policies. It seems to me that dialogue is essential. . . . The people who call for a boycott of Israel own the narrow view that performing there must be about profit and endorsing the hawkish policy of the government. It's like never appearing in the U.S. because you didn't like Bush's policies or boycotting England because of Margaret Thatcher." There is also the small matter of consistency: Costello did not, for example, stop performing in the United States or the U.K. after the invasion of Iraq. A handful of other artists have also canceled their Israel dates this summer, including Santana. For the most part, boycotts of this nature seem, at best, counterintuitive; at worst, contrary to the aims of the boycotters. Aimed at artists or academics, they only have an impact upon those who are working to change the facts on the ground, hardening those who already on the side of peace, having no impact upon those who do not believe in peace to begin with. There are those who disagree, who say that Israeli society as a whole has to suffer until the situation on the ground for Palestinians changes. It's hard to believe, though, that Costello has much of an impact either way.